And then the dust settled. The moment had passed. Just like that. I got off the phone with Robin, digesting her exciting news. Breakfast and coffee were served and enjoyed. The kids zipped off, fueled and on to other activities. Dishes were gathered up, and I was able to spend some time reclaiming my precious kitchen from the mess of living life. The lambs went on their way, and I wrapped a net fence around the pavilion as a deterrent for their curiosity. 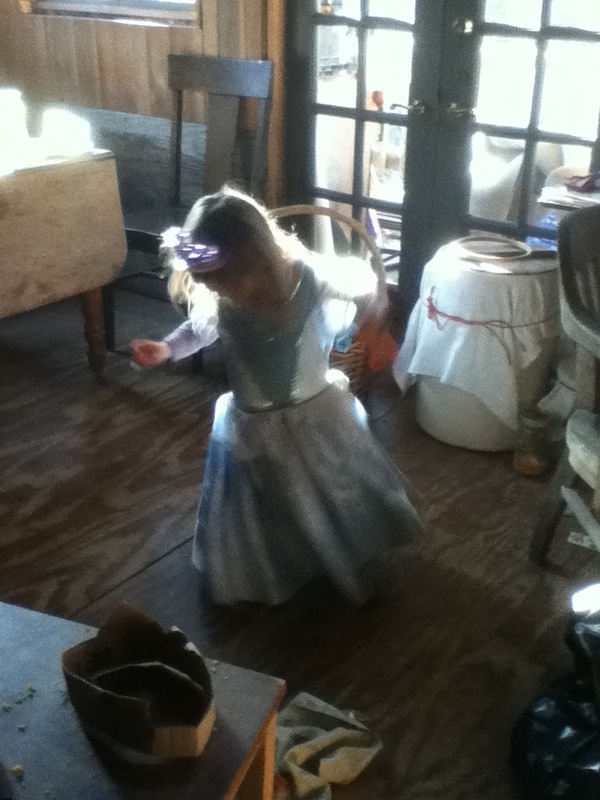 The wild dance had left me a little breathless, bewildered. But at the same time, my heart was pumping my limbs full of love and affection for my little whirling dervishes, and for the chaos that flows and winds and twists it’s way through my life. It’s unavoidable, really. The chaos. 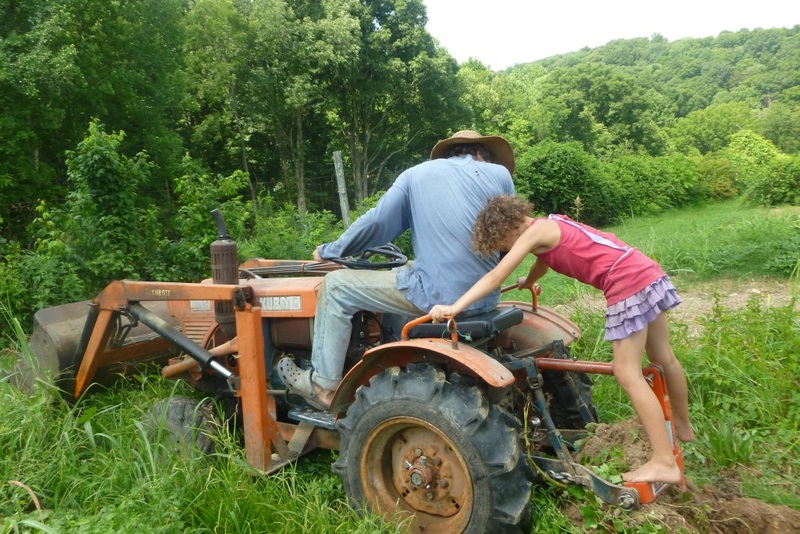 As we attempt to navigate our way through the unchartered terrain of raising our children, homeshcooling them with mindfulness, tending bumps and bruises, serving as waiter, chef, and dish-washer, story-teller, math problem-solver, as well as working from home on a big farm, raising primarily all of our own food, preserving and storing it, tending lots of animals, and just generally trying to sail our family’s ship in the general “right” direction of our goals, there’s going to be some chaos. While I thrive in peace and harmony, it’s the chaos that stirs things up; that challenges me and makes me get moving and grooving and working my tail off to reestablish a hint of order; to pacify the natives. 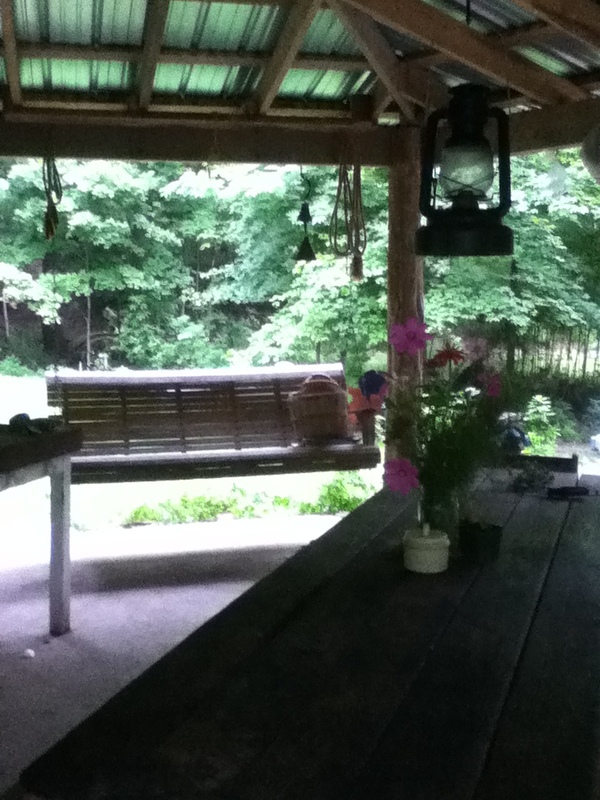 Just a few nights ago, in the very same kitchen, I sat quietly alone on the porch swing. The day was fading into night. I had just finished cooking supper and Eric had hauled it into the house to be consumed indoors, as it was nearly dark and the air had a slight chill (amazing for July, I know!). 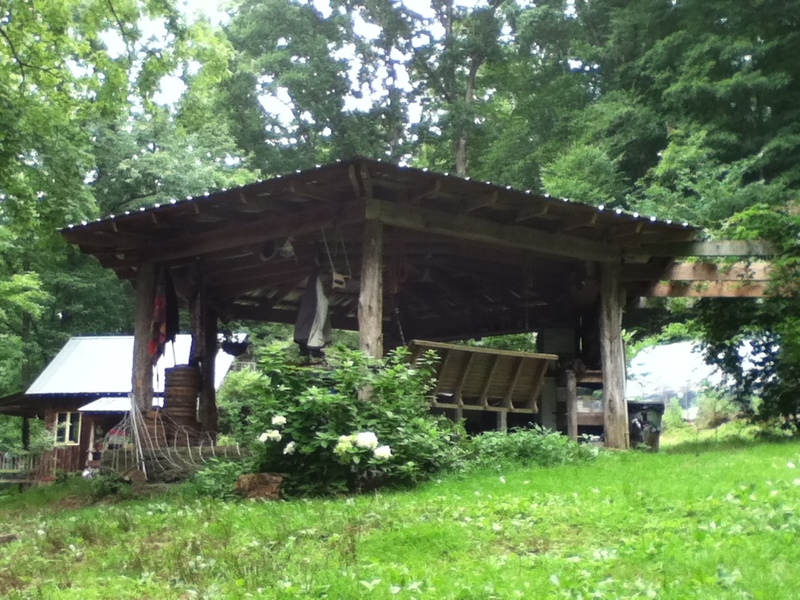 Rain started softly ringing on the tin roof, and eventually came down in a torrent so hard that the drumming of the rain drowned out the sweet voice of Ruth Moody that I was listening to. And I paused for a moment longer, enjoying the relative calm and the cool moist breeze blowing through the pavilion. In that moment, I was alone. But in my mind’s eye, I kept seeing my beautiful, smiling children. I kept hearing their laughter. I got up from my moment’s reverie, walked the slate walkway to the house, and entered the bright and bustling abode, ready for another tango with chaos. Rain threatened, and we headed to hill to get some big jobs done. Big job number one: dig potatoes. The kids spent a lot of time in the shade, but when they pitched in, they were a big help. You never know what’s going on with those underground crops. 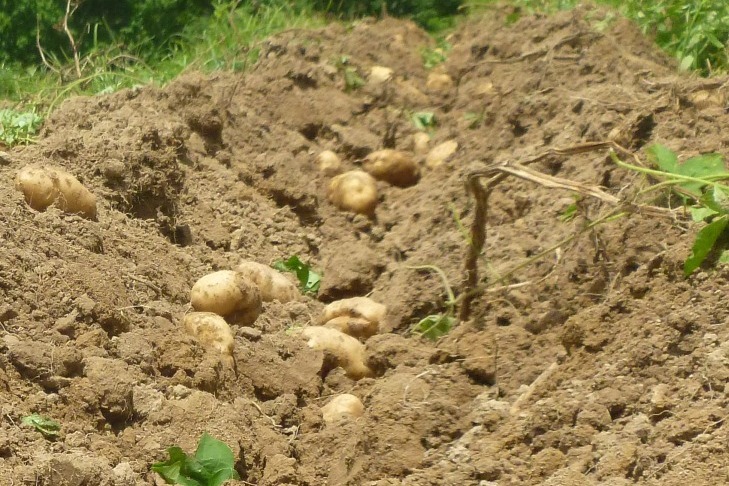 The weeds were really out of hand, but the potatoes were just great. We planted just over a bushel, and hauled fourteen bushels down the hill. Best ever. I had a day off. Well, maybe not a day off, an unexpected unusual day on the farm: the CSA farmer’s equivalent of a snow day. I stayed home from market. We are way more comfortable when there is someone back at the farm during our long market day. Sasha tends to the livestock, but an adult sidekick is needed in case of emergency. Usually the apprentices rotate through this day, market day, farm day, and back again. With Deanna out of town, I quickly realized it was easiest for me to stay back. It could be an adult only market day (eliminating the near full time job of watching an active 2 year old at the market). I still had to wake at 3 am with Paul and ready him for market as did William, but we had the luxury of snuggling back into bed at 3:45 when the van pulled out of the driveway. A drizzly morning led to a slow moving round of chores and an extra long spell of kitchen time. 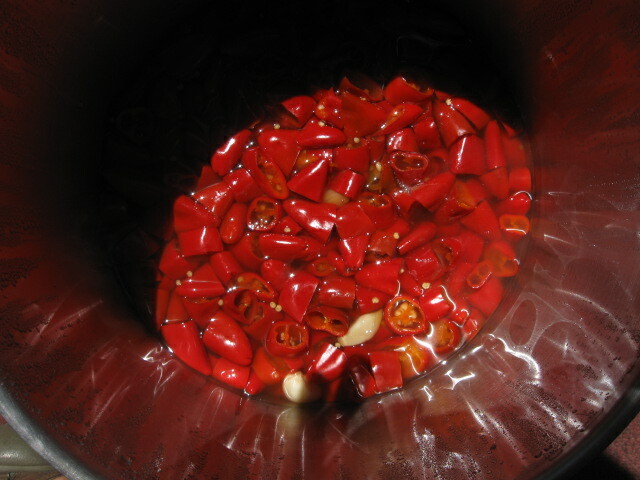 I made quick work of it and processed a batch of my new favorite condiment: home made sriracha. Made exclusively with the mildest of hot peppers we grow here, Czech Black, this hot sauce is the perfect addition to our plates, edible spicy, love it. When the skies opened blue we headed out to a clearing project in the “wedding field” named of course for it was the chosen location for Paul and my nuptials in 2001. Sasha has taken over the clearing of the “old place”. When we first moved onto our original 60 acres, they included a scant 5 acres of open land. 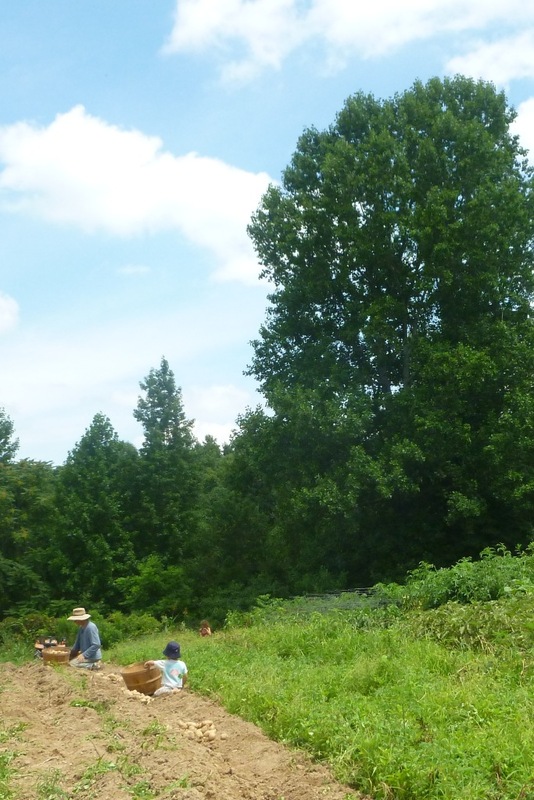 We began the process of clearing old logging yards that had long since overgrown and returning some of the gentle hillsides into the pastures they once were. When we purchased adjacent property we increased our open land perhaps three fold and abandoned the labor intensive task of clearing scrubland. With Sahsa’s youthful energy and 2 horses to care for, he has taken over where we left off and is most certainly a grass farmer in the making. Over the past years since he has gotten his horse and taken over managing her food supply, he has learned first hand the significance of pasture management. 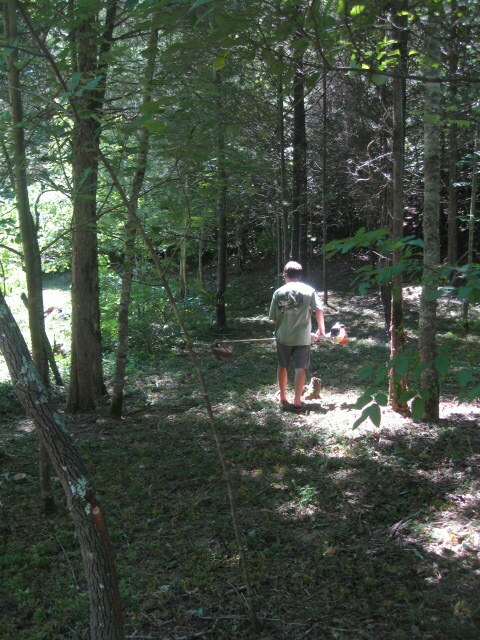 Now, with not only a push mower, but a riding mower, weed eater and chain saw to call his own, he can truly manage these areas of the farm in a way that benefits all. Back to my day off. After William woke from a long and late nap, my whole posse happily headed to a remote corner of our acreage. Along side me was a happy teenager hauling all sorts of tools, a thrilled toddler in the creek “deep” “fishies”, and a gleeful middle daughter toting the picnic lunch we all carefully prepared. The sun was shining, the air had the post storm crispness that we all adore. I found a way to please the whole crew: teenager adores power tools, toddler adores water, mud, trees, grass and wild berries, and middle daughter loves a good picnic with her family.Mama, well, I was just happy for the restful break from routine.